It's the perfect birthday, or any occasion gift. Or just the thing to reclaim your own recliner from your kids. 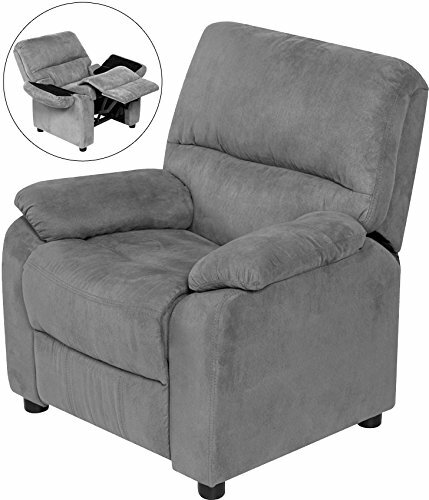 Whatever the reason, the 60-7101KU04 offers more than comparable models, including comforts and conveniences you might not always find on adult recliners. For instance, there are two USB charging ports conveniently hidden under the armrest. Each 2A port is powerful enough to charge any smartphone, tablet or other USB digital devices quickly and safely. Simply flip the armrest up and to the side to locate it. You'll also notice some extra storage space. In fact there's ample storage space under both armrests – perfect for storing game controllers and other stuff that might get left around the room. The upholstery is soft, easy-clean microfiber, and the support-soft foam cushioning keeps your kids comfortably and properly seated. It's ideal for the playroom, kid's room, media room, or den. What's more, it supports up to 150 pounds to accommodate a variety of ages. The best thing is, your special someone will think you're pretty cool for getting one. The price is pretty cool too. This special recliner is offered by Relaxzen, an early innovator in massage seating and part of the Comfort Products family. With a history dating back to 1919, Comfort Products makes design and innovation affordable.